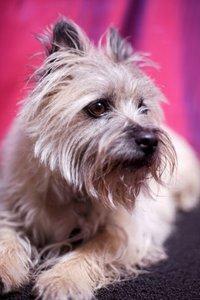 Cairn Terriers are easily recognized as Dorothy's beloved "Toto" from The Wizard of Oz. Read on to learn more about this charming yet feisty breed. The Cairn, a Scottish breed, gets its name from the job it was bred to do, mainly to rid farms of vermin by cornering them in their dens or "cairns" until the farmers could get there to finish the job. These hearty dogs were once grouped together with Scottish, Skye and West Highland White Terriers, but these breeds were separated out around the early 20th century and have been bred separately ever since. Today the Cairn is more often a household companion rather than a working dog. Cairns are feisty little creatures that stand about 10 to 12 inches tall and weigh 14 to 15 pounds on average. They are well-muscled and fairly low to the ground. Their skulls are slightly broader than they are long, and they have a well-defined stop and pricked ears. The eyes are wide-set in varying shades of hazel and should have a keen, bright expression. Cairns also have very strong paws to help them in one of their favorite pastimes - digging! Tails are held upright on full alert. The Cairn's double coat is rough and weather resistant with a harsh, longer outer coat and a shorter, softer undercoat. All colors are acceptable other than white, and darker tippings on the ears, tail and muzzle are preferred. Cairn Terriers are quick of mind, inquisitive and always up for an adventure. This can be both good and bad. These dogs have rather dominant personalities like most Terriers, and they will definitely attempt to rule the roost if you don't establish your rightful place as pack leader from the very beginning. Cairns are quite family oriented and friendly with those they know, but they are also very independent. Bear in mind that these dogs were bred to dig their way down tunnels in pursuit of their quarry, and they still have a strong instinct to dig today, whether it's under your fence or in your garden. It also stands to reason that these dogs' background chasing vermin usually leads to difficulty getting along with smaller pets in the home. They will also try to establish dominance over other dogs, and this can lead to quarrels and scraps. There is little that you can't train a Cairn to do. Obedience training is imperative for establishing yourself as your dog's leader. These dogs also do well in Terrier trials where they "go to ground" looking for vermin. They also do well in agility training although they aren't quite as competitive as other breeds. Cairns also enjoy spending a day in the field as hunter companions. Cairns have a lot of energy to burn, so daily exercise is needed to keep them fit. They should take a long walk everyday, and it's even better if you have an area where you can give them some time to run freely and explore. This is not only good for their bodies, it provides stimulation for their busy little minds. Cairns also love to play with their people, so don't be afraid to get out the Frisbee or ball for a rousing game of fetch. The good news is that Cairns don't really shed in the typical way that leaves loose fur floating around the house. The bad news is that loose fur tends to hang in the coat and cause mats. This means that it's necessary to brush these dogs three to four times a week. Bathing should take place about once a month. It's also necessary to trim those bushy eyebrows and upper muzzle hair away from the eyes, as well as trim the hair growing in the ears for better air flow. Dogs who do not wear down their nails naturally outdoors should be clipped every other week. Is the Cairn the Breed for You? Cairn Terriers make delightful companions for experienced owners who understand the importance of establishing themselves as their pet's leader. Cairns require active ownership, so if you're looking for a fellow couch potato you'd be better off with a Japanese Chin. On the other hand, if you lead an active life style and you're looking for a dog to share your adventures with you, the Cairn is more than equal to the challenge.